Howdy once again, friendly Internet visitor. Last time I talked about what copyright is and what fair use is and provided a handy-dandy chart to help you determine if you’ve violated copyright or not. This time we will talk about where to find royalty free images, sounds and videos that you and your students can freely use without the guilt of breaking the law. To get the whole list click past the break below. Before we get too far let’s talk about these types of material you will run into. A lot of people (not just us educators and our students) will search through Google’s image search and then simply copy and paste. You see it all the time, but this is not the best method. 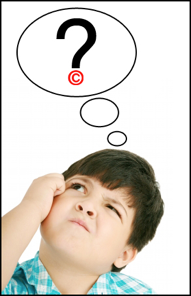 You could be using copyright material and not even know it! Just because it’s on Google and using Google is free, doesn’t mean that image is free to use. While there are quite a few royalty free and public domain image sites out there these are some of the better one’s I’ve found. All the images on this site are completely free to use, but they do ask that you give credit to the owner of the image as it is written on their About page. The images here are pretty good and Morgue files will also search other websites with royalty free images, but all of these other sites do require you to pay to use their image. When you find an image you like and click on it, you get this handy window where it gives you the detail about attribution and you can even crop the image right here too! Where Morgue File hosts the images, Veezzle simply scours the Internet looking for free royalty free images. When you find an image you want (in this case of an adorable puppy) it will take you to a new page. Here it will tell you where it comes from, information about the license, how to use, etc. Rest assured though, if it is on Veezzle, then it is free. There are plenty of others out there and you can check out my Delicious list of them here. This is a little easier to do because music and sound effects aren’t as ubiquitous as images. This site offers free full length music files that you can download and use for free. Most of the music is free to download and use but there are some that do charge. Sorry there is no Psy, One Direction, Tupac or any major recording artist here on Jamenod, but you will still find lots to chose from. Simply search for something you’re looking. You can preview the song, then if you want to download it, simply click on the download button. Once you have the file do as you please. Just don’t re-upload it as your own work. That is very uncool. Maybe you’re not looking for music. Maybe you need a sound effect for a video project? Well SoundBible has got you covered. They have sound effects and music as well, but these audio files are completely free and also copyright free. It is a virtual treasure trove here of sounds that you and your students can feel free to use as much and as often as you like with no fear of copyright infringement. You see, almost everything on YouTube is royalty free. Obviously professional music videos and the like are not but that leaves more than 99% of its content free for you to use. Now, you can’t download it and redistribute it-that’s illegal, but you can link to it, embed into a website, share it on Edmodo as much as you like and not lose any sleep at night. Another great website to find wonderful videos is Vimeo. Like youTube nearly everything here is royalty free and you can embed it wherever you like! There are also www.teachertube.com and www.schooltube.com but I find that these sites are very limited in their offerings and it can sometimes be tough to find good quality videos. I would stick with YouTube and Vimeo. So there you have it. If there are any resources you’d like to share be sure to leave them in the comments! This entry was posted in copright, Patrick Cauley and tagged royalty free media. Bookmark the permalink.